1972 Academy Award nomination for ''Norman Rockwell's World...An American Dream'' about the life of Norman Rockwell, the quintessential American artist. The film went on to win the Academy Award for Best Live Action Short Subject that year. 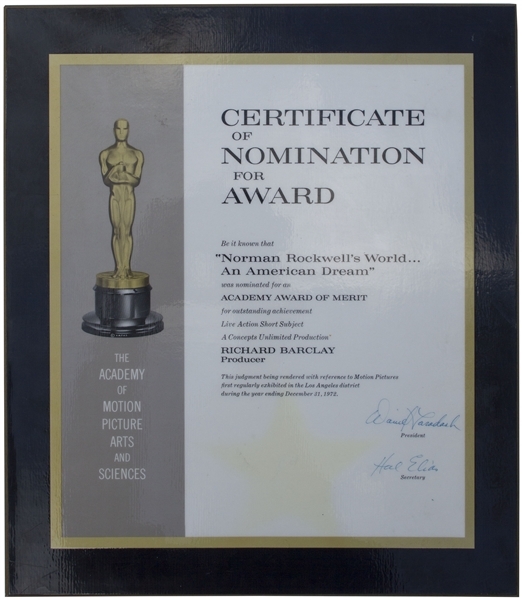 Plaque is signed both by then-president and secretary of the Academy, with Oscar figure displayed along left side. Certificate is inlaid in wood and measures 12.25'' x 14''. A few small nicks, and shadowing of a gold star; overall in very good condition.